Peridot, ranging from bright yellow green to a deep lustrous green, receives its name from the French, the last syllable pronounced "doe". 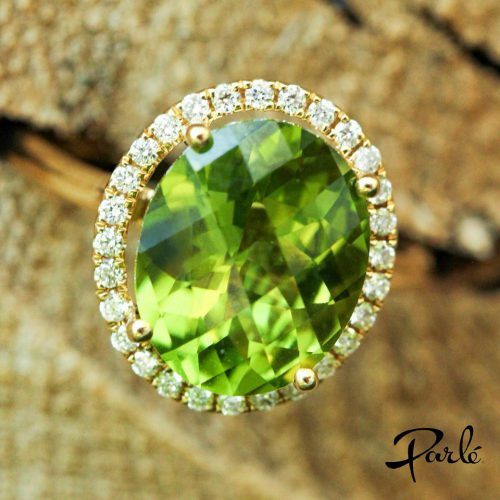 Prized by Egyptians and believed by Native Americans to have mystical powers, Peridot has been popular throughout history. There is evidence that the breastplate of the high priest Aaron contained Peridot as one of its twelve stones. These stones were credited with showing true spiritual preaching accompanied by miracles. Ancient belief held that Peridot has the ability to ward off fevers when carried under the tongue, and when powdered, to be a remedy for asthma. There are only three major sources of supply for this gem; an island in the Red Sea, the gem gravels of Burma, and Arizona. Peridot, like diamond, is formed in volcanic fires, making them unique in the gem world. Our favorite Gem Junkies also had a full Podcast episode on Peridot.